You have just heard a great sermon. You can sense that many people were touched. There is that feeling that going to Church is so good, so heartwarming, and so meaningful. Yet, after the refreshments and the fellowship hugs and kisses, come Monday, and things appear to be back to the usual grind. Familiar? When we talk about the Christian life, it is not only about what happens during the Sunday service, but also what happens after the Sunday sermon. In my experience as a preacher, there are at least 4 types of respondents. The first type is the diplomatic type. These are the ones who tell you "Great sermon!" no matter how bad you thought your sermon was. They would smile at you and say nice things simply because you are God's servant and they had to give you the benefit of the doubt. This happens most of the time. It's a wonderful way to just be nice and not commit oneself to be defensive in any way. Unless the preacher was to ask: "Which part exactly did you find it great?" The second are the skeptical who would either give you a quick piece of their mind about your message or send you some negative feedback sometime over the next few days. Friends of mine would appreciate not having any feedback at all within the first few hours after delivering a sermon. Giving one is already mentally and emotionally exhausting. It is not easy for the preacher to receive criticisms in a "weakened" state. While people may claim to speak the truth in love, the suggestion is to pray and wait until at least a 24-48 hours gap before giving a comment. Alternatively, congregation members can put down in writing via an email but keep it in DRAFT mode. Usually, over time, any negative feedback would be more nuanced and tampered with more grace. Shooting off the hip is never a good thing, especially when giving complaints. The third are the nonchalant where no amount of pulpit feeding can ever get them to get outside their comfort zones. They are anchored on their concrete ground of self-affirmation and absolutely determined not to let anything interfere with their way of life. Maybe, their focus is simply on the refreshments and the fellowship time at the end of the service. Some may have dozed off for the most part of the sermon, so they do not have much to feedback about, little act on them. The fourth are the ones who would keep the message in their hearts. They remember the key points and appreciate the way God has been speaking through the weeks. It can be a story shared or a quote said. It can be a passage that jumps out of the page like never before. When the seed of the Word is sown, the Spirit will aid in the germination and the people will respond accordingly. Being fruitful is a mark of the Christian. 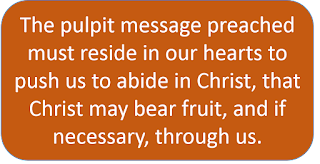 More precisely, it is abiding in Jesus that we see Jesus bear fruit, and if necessary, through us. Very often, we hear teachings from the pulpit that we need to do this or to do that. We must practice kindness, show grace, or help the poor. We must give of our best to our work and be faithful in our service in society. What about putting the focus not on what we can do but on Jesus who is the enabler of all good works? What about living in such a way that our good work is a direct reflection of the goodness and love of God? What about acknowledging that without Christ, we can do nothing? In a recent documentary entitled, "Godless," I was appalled at how some wayward Church denominations have lost their spiritual bearing and focus on God and chose human wisdom instead. One such church is West Hill United Church in Scarborough, Ontario, Canada that had changed "the glory of God" to the "glory of good." Led by an atheist minister called Gretta Vosper, the church no longer have any mention of God in their beliefs. They worship the good, the moral choices of human beings, and the nice fellowship of people who are there on the basis of moral good. They think that the living is more important than the believing, putting the focus on good works more than good traditional doctrine. This essentially means that they have come to a point where God, a Divine Supernatural Being, is no longer necessary for faith, and irrelevant to daily living. How can any church call themselves "Church" when they do not worship God? By removing God altogether, they are surely on their own. John 15 is an urgent call for us to remember that no matter how skilled or how brilliant we are, we are never in control of the world. Try we may, venture forth we can, but to think we are the masters of our own fate will be a serious error. Whatever we do, we do in gratitude to the grace of God. The words to Job powerfully remind us about how limited we are. I shudder to think about people who happen to boast their own abilities over God's providence. There are way too many unsolved puzzles in this world, let alone trying to take on Almighty God. Our responses to God's Word must never be in our own ability to produce fruit. It needs to be in being faithful to God, in remaining in God's grace, displayed in holiness and God's goodness. As we see this world more and more from God's perspective, practice living like Jesus, and to be responsive to the prompting of the Holy Spirit, we are on the way to fruitfulness. Whatever good deeds we do in the Name of the Lord, make sure we acknowledge the One who is the true worker: God. This should be our response each Sunday, and every Sunday. 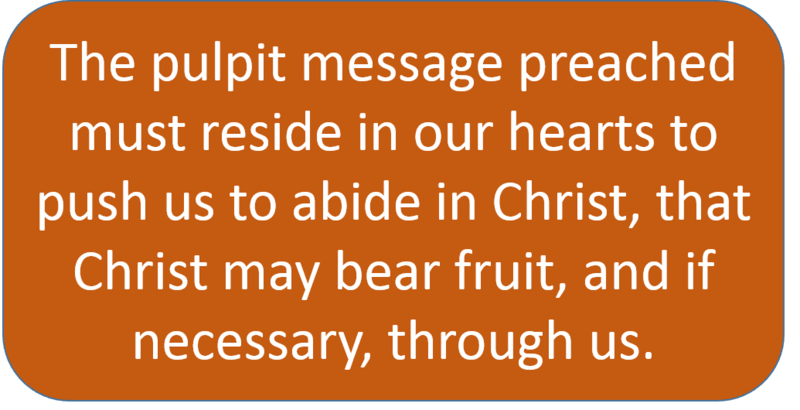 The pulpit message preached must reside in our hearts to push us to abide in Christ, that Christ may bear fruit, and if necessary, through us. THOUGHT: The fruit of the Christian life is not about good works. It is about God's work done as we abide in Christ and Christ in us. The visible sign of fruitfulness is when people see our good work and are pointed to the Source of all good works: God in Christ.